We had a fantastic turnout at this year’s Summer event, with customers coming from all over the country to visit us. As ever, it wouldn’t be what it is without our loyal customers who make the trip to visit us, so thank you. We’re already planning another for later on in the year, with even more special deals lined up for that day. We’ll be announcing details of that event soon. Following from another successful Harrogate Model Engineering Exhibition, we’re now looking forward to the next show on the calender – the Warco Summer Open Day. 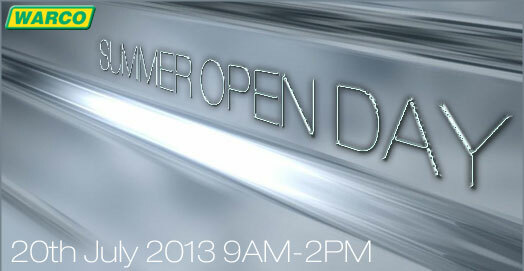 We’ve fixed the date for this year’s Summer event for Saturday 20th July 2013, and it’s set to be as big as ever. This summer, we’ll be opening our doors once again and displaying our full range of machines, tools, lathes, milling machines, accessories and much more. Many products will be on sale at show only prices, so if you’re considering buying something from us, making it to the Warco Open Day is always highly recommended. There will be plenty of parking this time around – we’ll be using a whole field opposite – as well as onsite catering. As well as our full range of new tooling, we’ll also have on sale that day an ever popular selection of second hand and ex-demo machinery, tools and accessories – so there’ll be something for everyone.